Resilience over profitability: Could agricultural research deliver on both? 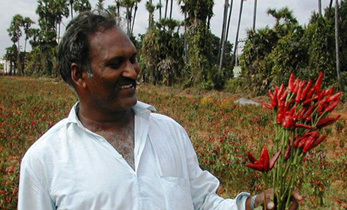 “Although in recent years we are inclined towards separating the two issues while designing research, reviewing our agricultural research for development over the past 45 years shows that it is possible for research to develop win-win technologies,” says Kai Mausch lead author of a ‘new study’ looking at how ICRISAT research could improve both farmers’ resilience and their incomes. “Subsistence and market-oriented farmers have different production objectives in mind and need different types of technologies. Yet, in many cases a technology can increase both profits and resilience through on-farm interactions or small changes in the technology and develop it into a win-win solution for the household,” adds Dr. Mausch. It is clear that the distinction can never be absolute and subsistence-oriented households need cash income and market-oriented households need to be resilient to cope with external shocks. Comparing past success stories compiled by ICRISAT with the current strategy as outlined in the first generation consortium research programs highlights the push towards a clear segregation of the two high level targets. Of the 13 technologies described under the CGIAR Research Program (CRP) initiatives for Dryland Cereals and Grain Legumes which are led by ICRISAT, the study found that 75% focused on raising productivity and were targeted at market-oriented farmers. 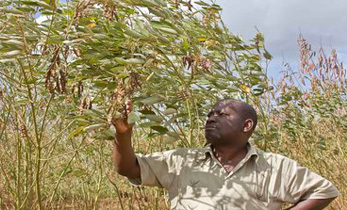 Other technologies, for example, the heat-tolerant chickpea designed specifically to overcome climate extremes were targeted at subsistence-oriented farmers, suggesting ICRISAT’s tendency to separate the two issues and target groups. Has the twin-track approach evolved? If solutions and technologies are to be more effective to match the complexities and diversities of smallholder agriculture, institutional learnings should be factored into research. To assess this, 20 of ICRISAT’s self identified success stories were analyzed, revealing that 65% of the technologies enhanced resilience and 85% increased profits. However, 50% of the technologies significantly increased both resilience and incomes, making a case for developing win-win technologies. While looking in more detail at the win-win technologies, it appears that once the solutions/technologies were released to address one target, they often evolved differently than originally intended, shaped by the context and experimentation by farmers. For instance, the Integrated Striga and Soil Fertility Management strategy for pearl millet and sorghum used in Mali, West Africa showed that a strategy to increase resilience can also increase profits after being rolled out. 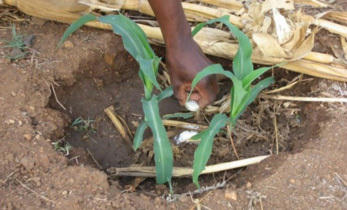 The parasitic nutrient sucking Striga weed haunts sub-Saharan Africa with a potential of wiping out more than 50% of major cereal crops. 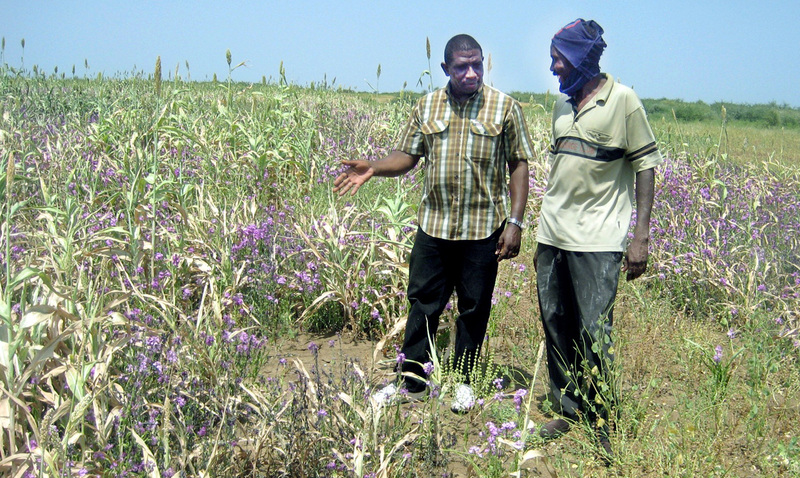 In addition to Striga resistant seeds, the strategy combined intercropping with cowpea or groundnut, micro-dosing fertilizer, manuring with compost, and hand-pulling Striga when it flowers. 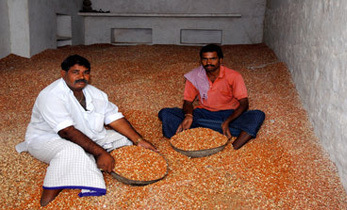 The farmers soon identified the market opportunity to sell cowpea/groundnut as a secondary source of income and thereby increased their overall profits while enjoying a stable cereal harvest. 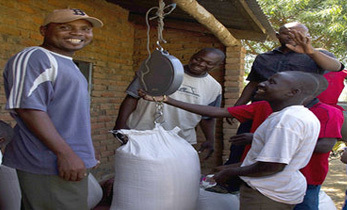 This example shows that although the technology was not designed to address resilience and incomes at the outset, due to experimentation by farmers and researchers, the technology got fine-tuned, eventually emerging as a win-win solution that delivered resilience as well as higher incomes. “Most commodity CRPs want to see the commercialization of smallholder agriculture, viewing agriculture as a business venture. A view that has been encouraged by the funding community. 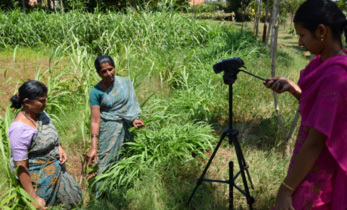 The review process of the two CRPs led by ICRISAT urged scientists to link technologies to market-oriented and subsistence-oriented farmers separately. The outcome of this is yet to be seen, but it is likely to discourage broader thinking about technologies, their emergence in farmer fields and to detect win-win options,” Dr. Mausch added. Another fall out from this divergence and from the increasing focus on market-orientation and profits lingers on, posing a larger societal threat. More and more resource-poor smallholder farmers, especially in the global drylands are facing new challenges introduced by extreme climate, environmental and institutional crises. Without relevant context-specific technologies to ensure their resilience in the short run and possibly help transition in a sustainable manner from subsistence to becoming self-sufficient and market-oriented, they run the risk of being left out of prosperity. Factoring in smallholder diversity including gender in agricultural research is highly important. Effective solutions for both groups are needed and keeping a look out for win-win technologies becomes even more critical. The brand new CRP on Grain Legumes and Dryland Cereals (GLDC) takes a systems approach to increase productivity, profitability, resilience, and marketability of critical and nutritious grain legume and cereal crops grown in the drylands of sub-Saharan Africa and South Asia and appears to have captured the lessons from the previous phase to heart. The CRP on GLDC is an initiative of ICRISAT along with 8 CGIAR research centers and 46 partners from industry, government and civil society.